Let us wine & dine you in our hospitality suite (Wynn Tower Suite). Join the APM crew and our music producers from around the world learn the latest! Add us to your MyNAB Schedule! As a proud member of NAB (The National Association of Broadcasters), APM Music will be at The NAB Show® again in April, where content comes to life. Let us wine & dine you in our hospitality suite (Wynn Tower Suite #2401). Join the APM crew and our music producers from around the world learn the latest and get swagged! APM Music is a proud member of NAB (The National Association of Broadcasters). For 2017, we will be at The NAB Show® again, where content comes to life, and we would love to meet up! As a proud member of NAB (The National Association of Broadcasters), APM Music will be at The NAB Show® again this year, where content comes to live! Join us! APM Fun with Photos at NAB 2011! The APM Music Team is still reeling from the excitement of NAB 2011 and this year proved to be great for catching up with current clients while also connecting with future ones! The Happy 3 Hour was a hit at the APM Music booth, where current new & future clients came to meet & greet some of APM's composers and music producers! 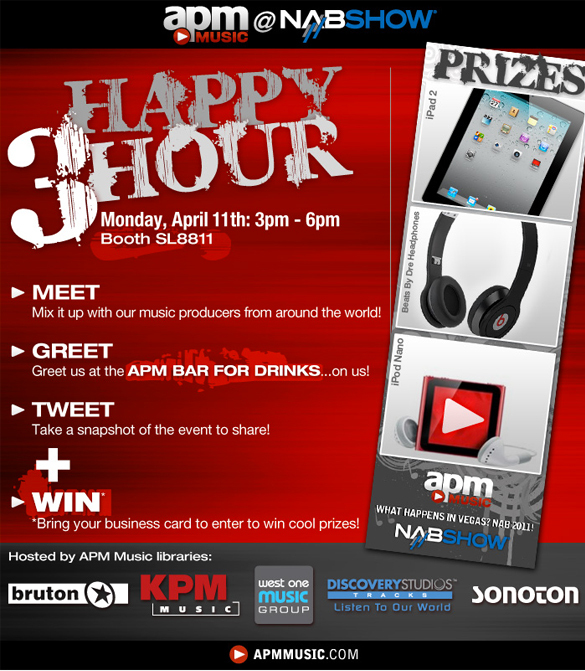 Join us for a Happy 3 Hour at NAB 2011! Planning a trip to NAB in Vegas?